A machine, called a dialyzer, filters waste and excess fluids from your body. Patients are hooked up to the machine via an entrance into one of your blood vessels called a vascular access. Depending on the individual’s condition, this vascular access may be temporary or permanent. During a hemodialysis session, blood flows in increments through the filter inside the dialyzer removing waste and restoring the proper balance of minerals in the blood. Once the blood is “cleaned”, it is returned to the body. 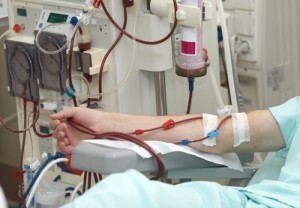 Most patients need dialysis treatments several times a week. Session lengths may vary depending on each individual’s condition at the start of the session. Peritoneal dialysis cleans the blood using the lining of your abdomen as a filter. Before your first session, you will need surgery to place a catheter into the abdomen. When it’s time for a dialysis treatment, the dialysis, or cleaning solution, is inserted into the catheter, filling the abdominal cavity with the solution that absorbs waste and excess fluids. After a period of time, the dialysis solution drains from your body, carrying the waste with it. This method allows patients to have dialysis while they sleep, work, or perform everyday activity.